People aggregators are search engines that look for people’s data across dozens of social media, community webs, public profiles or professional networks. It can combine a person’s profile from Linkedin, technical information from StackOverflow and contact information found on Facebook or Twitter. It creates its own database of profiles that is quickly searchable. Information that a human sourcer would take hours searching for is available almost instantly. There are dozens of people aggregators on the market with the best-known ones being Hiretual, TalentBin, Entelo or AmazingHiring. In this article, I’ll focus on AmazingHiring that quickly became an essential tool for our recruitment team at STRV. It specializes in IT talents and indexes more than 200 million technical profiles, like front-end developers, back-end developers, IOS, Android, data scientists, QA engineers, UI/UX designers, DevOps, and other tech specialists. When clicking on a candidate, you open up their full profile and see his/her photo, work history, education, skills, and social profiles. 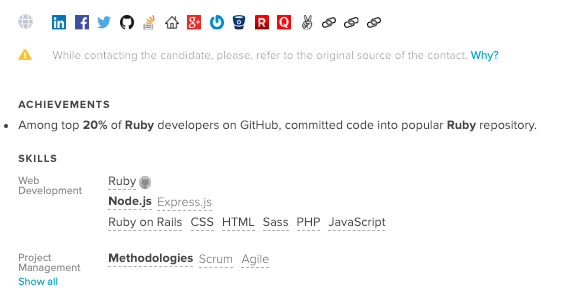 Unlike Linkedin, the profile is not made by users, but it’s generated by consolidating relevant information AmazingHiring could find from public sources such as Github or Stackoverflow and therefore provides a better picture of the candidate’s technical stack. The most amazing feature is the contact information. The system is pretty successful in finding a candidate’s email and approximately 95% of all profiles do have the contact address. This is the single most useful feature that can save you a lot of time. You don’t have to buy InMails, include messages in Linkedin invites or source emails one by one. Analysis of professional activity on the web reveals candidate’s tangible (rather than declared) skills — a critical distinction for selecting top few prospects among thousands found. AmazingHiring uses AI-based algorithms to analyze candidates’ background and rate talents based on their professional activity. It helps boost and improve the pre-screening stage. It means you can verify a candidate’s expertise and reveal top performers. 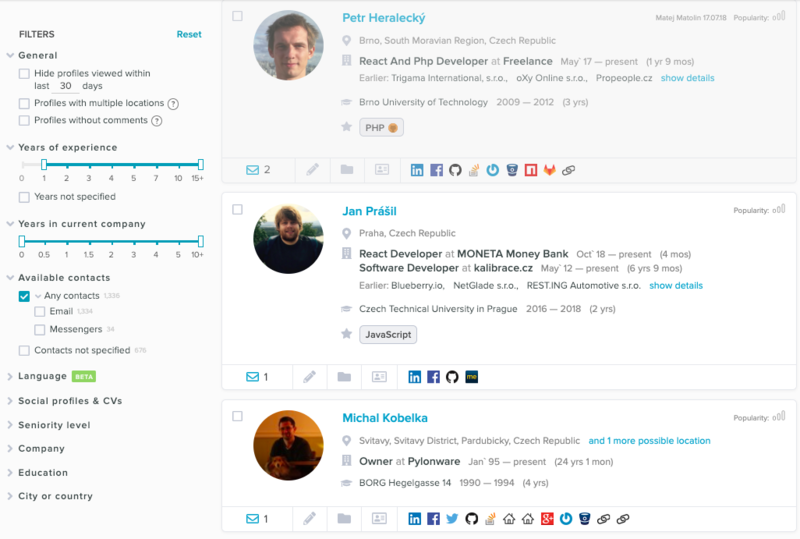 There are several useful features to organize the talent pipeline. You can create folders and move candidates to them, change a candidate’s status inside folders for each recruitment stage, tag candidates and write notes. This can even replace a simple ATS. AmazingHiring provides integration with other systems as well. It can be connected with an ATS, such as Greenhouse and simply transfer candidates there. We also integrate it with our mailing system called MixMax to launch bulk email sequences. One license of AmazingHiring costs $3,600 USD per year, which is significantly cheaper than other top aggregators. Moreover, it saves an incredible amount of time. All you have to do is prepare the search criterions, play with filters to narrow down your results and select the profiles with the most potential to contact. Super quick and super easy. I’m a big fan of automated sourcing tools. Finding data on the internet is a job that machines can do better. Humans should use their creativity to rather focus on communicating with candidates or delivering a great experience. A technical recruiter equipped with AmazingHiring can really multiply his capability and delivery. There’s a growing concern about privacy protection, and also social networks tend to lock their data and monetize them by themselves (e.g. Linkedin). People aggregators rely on publicly accessible data and might have a tough time in the future. But for the time being, they represent a solid competitive advantage with a great ROI.